There’s no real underwater action in the Half-Life games but with Ep3 coming that may change. This environment might make a great break in the action where the player has to get from one section of the game to another without being detected. Of course there would be sea monsters, like the Ichthyosaur from HL1, maybe even some automated defence systems. 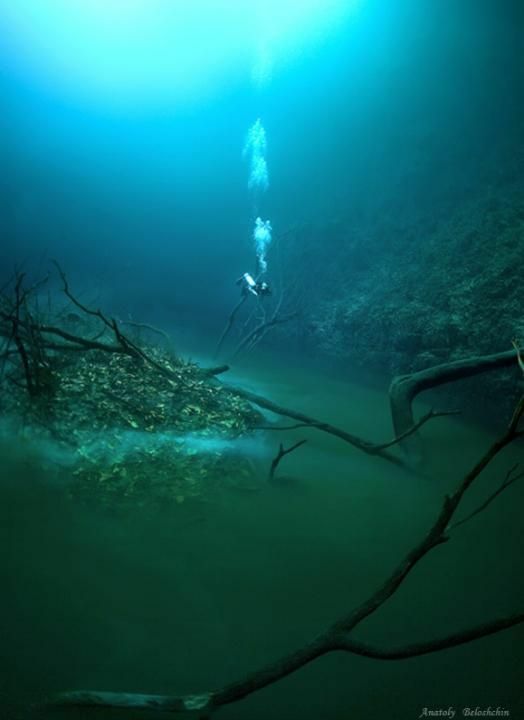 I’m not really an underwater fan but these images just make me want to swim slowly and explore. They could be great for a very atmospheric part of a mod. Why not have an underwater puzzle using the different densities of the liquids? 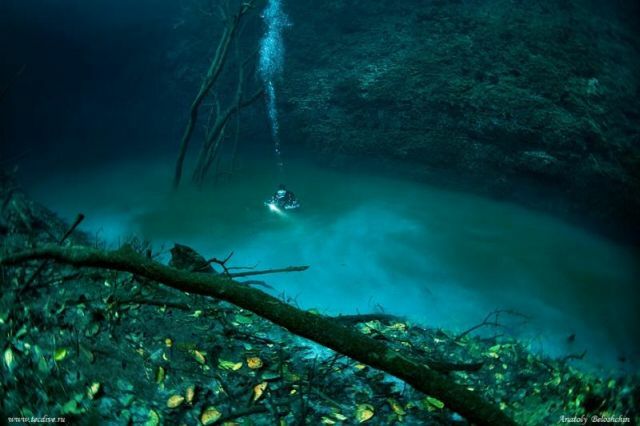 I have to admit, from looking at these pictures, it almost looks like you would have to create a water layer that’s UNDER another water later. I’m not even sure the source engine supports it, and it’s looks so unreal that I think I’d have trouble questioning it in a game. Definitely interesting, but it would take some serious skill to do it proper justice. Yeah the Source engine is pretty restrictive with water. It usually supports only one type of water visible at any time. Of course if Valve wanted to focus on this then I’m sure that could be changed. I love underwater sections if they’re done well. Modern Warfare 2’s oil rig infiltration was disappointingly linear and you didn’t actually get to explore at all. I think this would work great in Ep3. 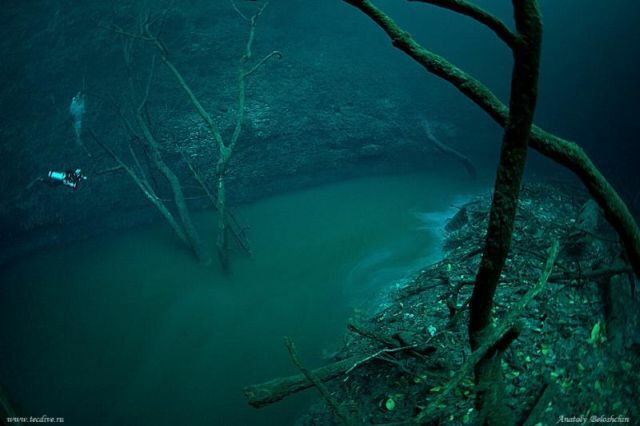 I put “cenote angelita” into Google. There’s loads of sites with pictures and several videos. Thanks for this; very enjoyable. 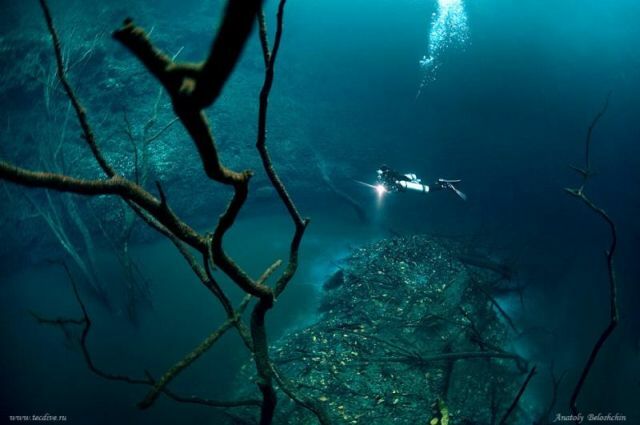 I put “cenote angelita” into Google. No need, I had already added a link in the post. Yes I know and used it. Thanks for that. I wanted a search for sites to learn more – and have. Would be interesting but it really wouldn’t be possible. Most guns wouldn’t work. You don’t really swim in any convincing way in the game. The game just isn’t designed to work with underwater combat. Now if someone was to do a coded mod that stuck you in a diving suit or anything, sure that could work but I think this is beyond the capabilties of mapping alone. I don’t really come at this with any background in making levels, but it seems to me that this IS doable in the current engine. It would NOT involve ‘swimming’, but you could adjust the gravity (can you not do that in hl2’s engine? if not, this doesn’t work as well); and then add “currents” similar to how large fans and waterways can make the character ‘drift’. Slow down motion, place things that “float’… adjust the lighting, and perhaps add large, slow versions of the “heat” effect that comes off of steam-pipes to make an underwater ‘visual’.